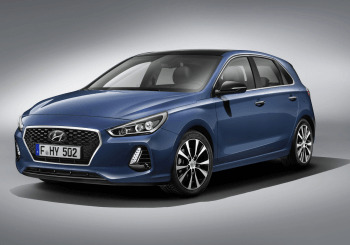 If you were waiting until the Paris Motor Show to see the all-new i30, you no longer have to as Hyundai have revealed info and specifications about the model ahead of the show. For more info on any of this safety feature do call into our Howards Hyundai dealership located in Yeovil. The South Korean car manufacturer is so confident in its build quality of the i30 that they are offering an industry leading 5-year unlimited mileage warranty. Now that’s confidence! Another first for Hyundai i30 is the addition of the brand new turbocharged 1.4 T-GDI 140 PS petrol engine. They have also revealed that they will be building in 2017 the eagerly awaited high-performance model, this will be developed under the Hyundai Motor’s N brand. A new design element has been added to the Hyundai design language, this is the new Cascading Grille that will feature on the new i30. This will become a permanent fixture throughout the Hyundai family in the future, adding to such cars like the i10. Other changes have been made not just the visual pleasing elements although these have been re-designed to provide natural flowing lines with a sculpted body. The bodywork structure also has been redesigned, 53% of it is made advanced high-strength steel that’s manufactured by Hyundai and has increased body rigidity by 22%. As a result of this bodywork redesign, the car’s body is weighing in at 28 kg lighter than the previous generation. The new body has been built slightly longer and wider than the previous generation measuring in at 4340mm long, 1795mm wide and 1455mm high providing a lower car, with the wheelbase measuring the same at 2650mm. The interior has been designed to be clear and intuitive to all occupants, Hyundai has gone with a horizontal design creating that feeling of roominess. There is an 8inch optional navigation touchscreen located on the dashboard that connects all navigation, media and connectivity features, so you can stay connected with your smartphone. Space is key within this interior, the feeling of space is created with not only the interior design but also the optional panoramic roof that can tilt and slide open. There is also room in the boot space for a family's luggage as it offers 395 litres which expand to 1301 litres when the rear seats are folded flat. Hyundai’s efficient engines CO2 starts from as low as 89g CO2/km, and can be hooked up to a 6-speed manual transmission (6MT) or the direct responding 7-speed dual clutch transmission (7DCT). As we mentioned above the performance N version will be released later on in 2017. This engine will be a 2.0 litre turbocharged petrol plant producing 260bhp with a top speed of around 155mph. The model name will be RN30, this has been indicated by Hyundai when they made a trademark application. If you are looking to purchase a new generation i30 then they will be on sale in the UK in the 1st quarter of 2017. So keep your eyes peeled on your closest Howards Hyundai dealership, or better still contact us to reserve a test drive as soon as we have a demo available. We look forward to seeing you!